« Kickbacks for Tsarnaev on luxury car repairs? This chart is an update to Money Jihad’s earlier post here. The only significant change is the inclusion of Lashkar-e-Taiba, for which revenue estimates now range from $5 million to $100 million annually. 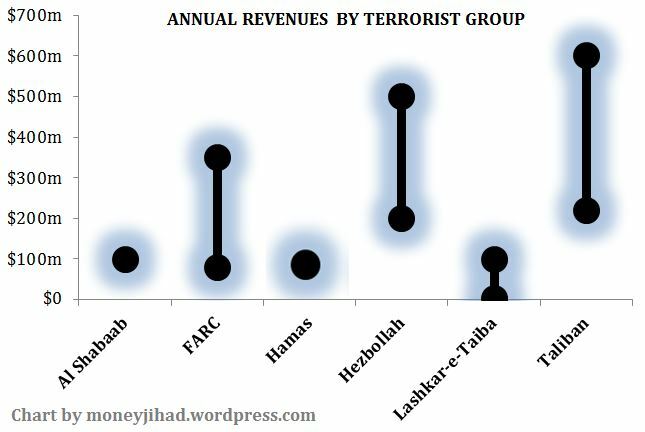 Al-Shabaab has faced revenue setbacks in the past year, but revised figures are not yet available. Good point. As somebody on TV recently said, Afghanistan has no money of its own. It’s not like Iraq where there was already existing infrastructure and oil resources. It’s difficult, undeveloped terrain. The money that’s there is largely based on our presence in the region through development & military aid. But a bit of an educated guess… I’d say 50 percent of the Taliban’s money comes from ushr on opium, 30 percent from zakat from Gulf donors, 10 percent from forced taxation on the locals, 5 percent from kidnappings for ransom, and the other 5 percent from misappropriated Western aid dollars. Footnote: According to this paper, http://www.diw.de/documents/publikationen/73/diw_01.c.386645.de/diw_econsec0052.pdf, the Algerian Islamist party Front Islamique du Salut has an annual financial flow of $5 million.